Home machinists can often find great deals on used industrial equipment, and many a South Bend lathe or Bridgeport milling machine has followed someone home. Then comes the moment to plug it in, and the new owner discovers that the three-phase plug needed to power the new beast is nowhere to be found in the shop. Thus commences the weeping and the gnashing of teeth. Luckily, [Handmade Extreme] is ahead of the curve in terms of shop power, and built a rotary phase converter to power his machines. Industry generally runs on three-phase AC systems, mainly because three-phase electric motors are so much more efficient and compact than the equivalent single-phase motor. But residential electrical service is either split-phase or, in the UK where [Handmade Extreme] is based, single phase. A rotary phase converter is an electromechanical device that can generate the missing phases – in essence a three-phase motor that can run on one winding and generate the missing phases across the other windings. It needs some supporting control circuitry to do so, such as timers and contactors to switch the winding connections once the motor starts, plus capacitors for motor starting and for balancing the voltage across the phases. The control gear is DIN-rail mounted and neatly wired to a smart-looking control panel. Everything is housed in a sturdy enclosure that’s big enough to serve as a mobile tool cart. It’s a really nice job – watch the whole build in the video below. If you’re interested in power distribution, we’ve got a primer that covers the basics. And if you’re in the market for machine tools, [Quinn]’s machine tool buyer’s guide will let you decide if a three-phase machine is worth the extra effort. Just about every hacker, maker and tinkerer out there received their early education the same way: A screwdriver in one and a discarded bit of electronics in the other. There is no better way to find out how something works than cracking it open and examining each piece. In recent years, teardown videos have become popular on YouTube, with some of the great examples coming from users like [EEVblog], [mikeselectricstuff], and [The Geek Group]. This week’s Hacklet is all about the best teardown projects on Hackaday.io! We start with [zakqwy] and his Savin C2020 Teardown. Photocopiers (and multifunction machines) are the workhorses of the modern office. This means there are plenty of used, abused, and outdated photocopiers available to hackers. [Zakqwy] got this monster when it started misbehaving at his office. Copiers are a venerable cornucopia of motors, gears, sensors (lots and lots of breakbeam sensors) and optics. The downside is toner: it’s messy, really bad to breathe, and if you don’t wear gloves it gets down into the pores of your skin, which takes forever to get out. [Zakqwy] persevered and found some awesome parts in his copier – like an Archimedes’ screw used to transport black toner. Next up is [Bob Blake] with Belkin WeMo Insight Teardown. [Bob] wanted a WiFi outlet, but wasn’t about to plug something in to both his power grid and his network without taking it apart first. [Bob] did an awesome job of documenting his teardown with lots of great high resolution photos – we love this stuff! He found a rather well thought out hardware design. The Insight has 3 interconnected PCBs inside. The power switching and supply circuits are all on one board. It includes slots and the proper creep distances one would expect in a design that will be carrying 120V AC mains power. A small daughter board holds an unknown chip – [Bob] is guessing it is the power sensing circuitry. A third board a tucked in at the top of the module holds the main CPU, a Ralink/MediaTek RT5350F SoC, RAM, and the all important WiFi antenna. [Drhatch] took things into the danger zone with an X-ray Head Teardown. We’re not sure if [Drhatch] is a real doctor, but he does have a Heliodent MD dental X-ray head. Modern X-ray machines are generally radiation safe if they’re not powered up. Radiation isn’t the only dangers to worry about though – there are latent charged capacitors and cooling oils which may contain nasty chemicals like PCBs, among other things. [Drhatch] found some pretty interesting design decisions in his X-ray head. The tube actually fires through the cylindrical high voltage transformer. This means the transformer acts as a beam collimator, focusing the X-ray beam down like a lens. He also found plenty of lead shielding. Interestingly there are two thickness of lead in the housing. Shielding close to the tube is 1 mm thick, while shielding a bit further away is only 0.7 mm thick. Finally, we have [danielmiester] with Inside a 3ph AC Motor Controller(VFD). [Daniel] tore down a Hitachi Variable-Frequency Drive (VFD) with the hopes of creating a frequency converter for a project. These high voltage, high power devices have quite a bit going on inside, so the conversion became a teardown project all its own. VFDs such as this one are used in industry to drive high power AC motors at varying speeds efficiently. As [Daniel] says, the cheaper ones are ” just really fancy PWM modules”. Handling 1.5 kW is no joke though. This VFD had a large brick of power transistors potted into its heat sink. The controller board was directly soldered to the transistors, as well as the rectifier diodes for the DC power supply. [Daniel] was doing some testing with the unit powered up, so he built a custom capacitor discharge unit from 3 C7 Christmas lights. Not only did they keep the capacitors discharged, they provided an indication that the unit was safe. No light means no charge. Not satisfied? Want more teardown goodness? Check out our freshly minted Teardown List! What good is a fiber optic self-lighting Christmas tree if it flashes so fast it will put you into an epileptic attack? The answer is “Not very good”, if you ask [Mads Nielsen] a.k.a [EcProjects]. 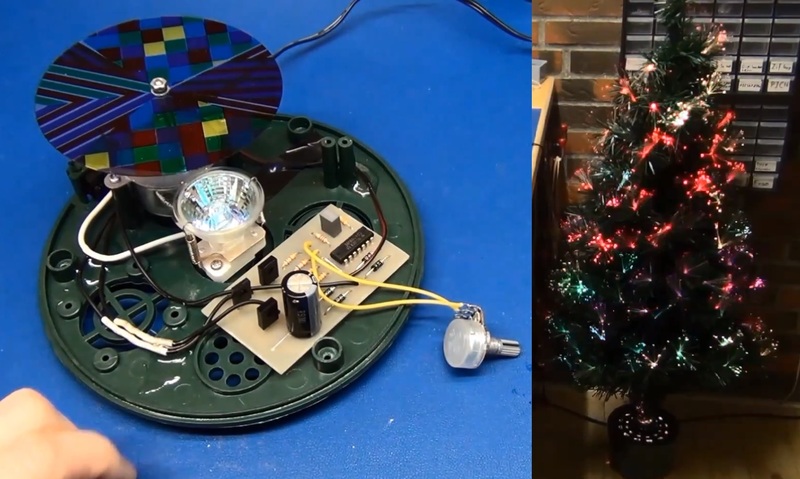 So [EcProjects ] started a little project to slow the Christmas tree’s blinkyness down to a more reasonable rate. The task didn’t seem too difficult at first but turned into a quality tutorial building a variable frequency H-bridge motor control. After opening the base of the tree [EcProjects] found a 12 volt AC geared synchronous motor turning a multi colored translucent plastic disk. A bright spotlight was shining upwards through the turning disk into the ends of hundreds of small fiber optics. This mechanism dumps loads of multi colored light out the ends of the fibers at the tips of the Christmas tree branches as the disk turns. His goal was to slow down the motor; however, the rotation was based on the 50 Hz mains signal. In order to continue using this motor a lower frequency AC power source was needed. What follows in the video is an excellent lesson on how an AC synchronous motor works plus how to build a variable frequency control and H-bridge using some transistors, resistors and CMOS 4069 inverter chip. In the end the frequency drive could only be lowered to about 30 Hz before the synchronous motor would stall and reverse using his design. [EcProjects] was bold enough to include several fails which always provides more opportunity for learning and is greatly appreciated. If you believe you have a better solution please share your idea in the comments. I’m sure the first proposal will include an Arduino and servo modified for continuous rotation, but any solutions would be fascinating including modifications to his design. You can join us after the break to watch the video.